Partial deconstruction of the Glasgow School of Art is set to begin "as soon as possible", following a fire that largely destroyed the building earlier this month. The dismantling of the Charles Rennie Mackintosh-designed building is set to take place after Glasgow City Council carried out a survey of the building that concluded that a sudden collapse was likely. "Work to partially dismantle sections of the Glasgow School of Art Mackintosh building is expected to begin in the coming days," said a statement from the council. The decision to begin deconstructing of the building was taken after surveys revealed there was "more substantial movement in the walls of the building than previously thought." The Glasgow School of Art has been substantially damaged by a fire. Image is courtesy of Police Scotland. 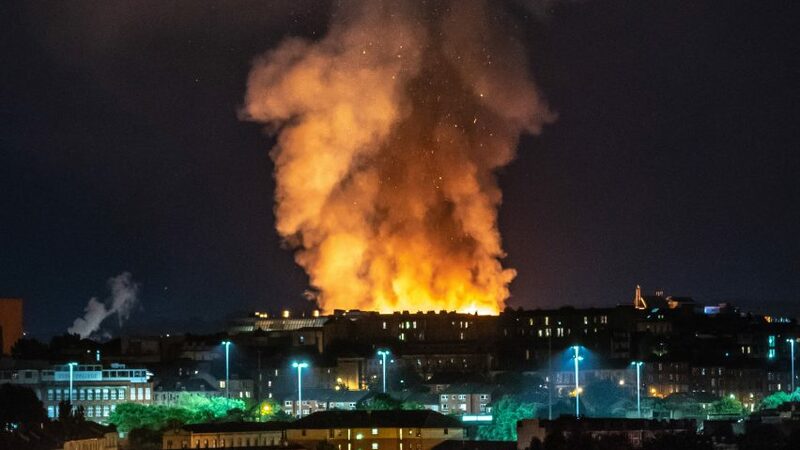 A large fire enveloped the Glasgow School of Art, which is the seminal work of Scottish architect Mackintosh, on Friday 15 June 2018 largely destroyed the building. At the time of the fire the building was undergoing a restoration following a fire that severely damaged the building four years ago. The extensive damage to the building was revealed in drone footage take by the art school shortly after the fire. Movement in the south facade, and the east and west gables was detected last week, and now Glasgow City Council has determined that this movement presents a serious risk of collapse. Deconstruction of the south facade is set to begin "as soon as possible", after a methodology to safely take down the walls is developed. There is a possibility that the east and west gables may also need to be taken down. "With each passing day a sudden collapse becomes more likely," said Raymond Barlow, Glasgow City Council's head of building control. "It has become urgent that we take down the south facade. As the process begins it will be likely that the other walls will also need to be reduced." "We do not know what effect this will have on the rest of the building so I have to be clear this site remains dangerous and is becoming more dangerous. It is particularly important that people observe the cordon which remains in place," continued Barlow. A debate has already begun on what should happen to the building following the devastating fire, with experts estimating that it could cost £100 million to rebuild the Glasgow School of Art. Leading Scottish architect Alan Dunlop has argued that to honour Charles Rennie Mackintosh's legacy, we should not build a "sad replacement", and should instead to come up with new ideas for its replacement. However, academic Mark Cousins believes that the building's importance means that it must be rebuilt. An investigation into the fire by the Scottish Fire and Rescue Service (SFRS) has begun. Main image is by Peter Swanton.